During the war, the poster on the left, painted by J. Howard Miller, was only on display for only two weeks. Norman Rockwell’s, on the other hand, was seen by millions. 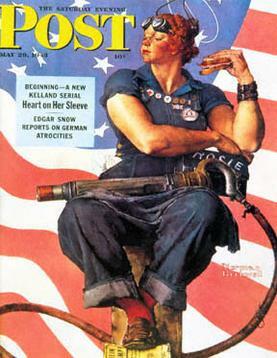 Seventy-five years ago, Norman Rockwell’s painting of Rosie the Riveter appeared on the cover of a May 1943 issue of The Saturday Evening Post. Many might have been already aware of the fictional Rosie from the radio. A year earlier, she made her first appearance in a nationally broadcast song. Now she was appearing on newsstands and millions of doorsteps across the country. Yet today, when people hear “Rosie the Riveter,” Rockwell’s painting isn’t the one that comes to mind. Instead, it’s J. Howard Miller’s depiction of Rosie – flexing, wearing a red bandana, accompanied by the words “We Can Do It!” – that we associate with the World War II cultural icon. Beyoncé has posted it on Instagram, Hillary Clinton used it in her presidential campaigns and a host of consumer goods, from coffee mugs to magnets, are plastered with Miller’s version of Rosie. All use it to send a message of female empowerment. But out of the many iterations of Rosie the Riveter, some may be surprised to learn that Miller’s “We Can Do It!” poster was, for a time, one of the least popular. The poster was displayed in Westinghouse factories for only a two-week period, and few Americans ever saw it during the war years. Why were other versions of Rosie the Riveter more popular during the war? And how did this version end up becoming the Rosie we picture today? Today, the now-famous image of Rosie the Riveter might evoke the heroic way women during World War II assumed jobs traditionally held by men – factory workers, taxi drivers and even soldiers – to help with the war effort. But during the war years, there was actually a fair amount of ambivalence about women entering the workforce, especially if they had young children. Efforts to provide adequate day care for women were met with considerable opposition. And the male workers who remained on the home front were resistant to the idea of having women work as welders, riveters and construction workers, fearing the feminization of these professions and decreasing wages. The cover of the sheet music for the 1942 Rosie the Riveter tune. Due to these concerns about fluctuating gender roles, much wartime propaganda would portray women who ended up assuming nontraditional roles in the workforce as attractive, white, feminine and middle-class workers. A U.S. Employment Service recruitment poster featuring a woman. The propaganda was also quick to depict their work as temporary – something that would last just for the duration of the war. In many of these posters, you can easily imagine the women returning to their roles as homemakers once the war was over. It certainly reflects the remarkable contribution of women to the war effort. She’s also more masculine than much of the wartime propaganda featuring women – something that undoubtedly inflamed American anxieties about gender roles. At the same time, her femininity is still present with her red lipstick and womanly figure. Of course, once the war concluded, women were forced out of these roles, and Rosie was largely forgotten during the baby boom years from 1946 to 1964. In the post-Vietnam era, feminists wanted an image of a woman that was visually appealing but not necessarily pro-war. In addition, compared with Rockwell’s painting, the woman in Miller’s poster is not as overtly working-class and could easily be manipulated to support a wide range of activist causes. In the end, the message feminists wanted to send with the image wasn’t the original message of the poster. Miller’s poster, like most of the Rosie propaganda, was supposed to be a call for men and women to work together for the duration of the war out of patriotic duty. But because they were still grappling with widespread job and wage discrimination, feminists simply wanted to use Rosie to show that women could perform the jobs traditionally held by men just as well, if not better. The slogan “We Can Do It!” was originally about winning the war. But it’s now meant to suggest women can do anything they put their minds to. The red bandana-wearing Rosie was feminine-looking and attractive, bold but not too confrontational. In other words, the image was a safe, malleable advocate, one that continues to be deployed today. If Men are Favored in Our Society, Why do they Die Younger than Women?